Somewhere in the twilight between stars and planets lie objects called brown dwarfs. Below about 8 percent of the Sun’s mass, physical conditions will never allow the fusion of hydrogen into helium, as happens in the Sun. There may be a flickering of en­ergy from the fusion of hydrogen into deuterium, but lower mass objects don’t have a sustainable source of energy. When they’re young, brown dwarfs are easy to observe in the infrared because they generate a lot of heat during their gravitational collapse. As they age, they get cooler and fainter. For example, a puny star 10 percent of the mass of the Sun would have a temperature of 3000 K and a luminosity 1/10,000 that of the Sun. By contrast, a brown dwarf 5 percent of the mass of the Sun would be three times cooler and a further 100 times dimmer. It would take a million of these feeble objects to equal the light of the Sun. Some astronomers con­sider Jupiter a failed star or a brown dwarf. Models indicate that brown dwarfs likely host moons like those of Jupiter and Saturn, worlds replete with weather systems, geysers, volcanoes, moun­tain ranges, and oceans—even if, as on Europa, the oceans are frozen over. Cameron anticipates how life might be adapted on an exomoon of a gas giant planet or a brown dwarf star. On such worlds, we might expect to find luminous biota highlighted with photophores as Cameron predicts or species with eyes better adapted to night or low-light conditions. Even as felines have dark-adapted vision superior to humans, the Na’vi have feline features and navigate the night-t ime forest with far better facility than the character Jake. 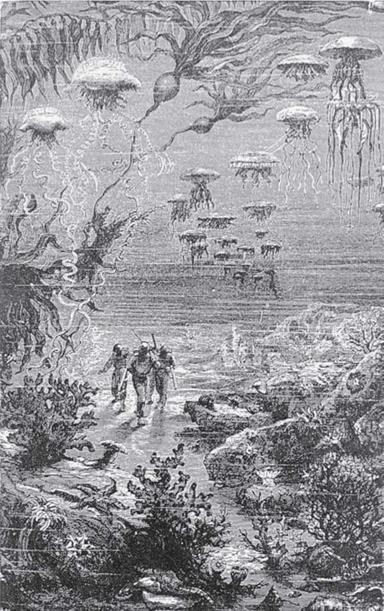 Cameron’s bioluminescent world may have been inspired by Jules Verne’s 20,000 Leagues Under the Sea, in which the char­acters, strolling on the ocean floor, encounter bioluminescent jel­lyfish and note their “phosphorescent glimmers.” Actually, nearly all jellies in the deep sea are luminescent. Verne’s voyagers likewise chance upon corals, the tips of which glow. In stark contrast to the nineteenth-century perception that the ocean floor was devoid of life, Verne imagined the seafloor abounding in bioluminescence. An engraved illustration for 20,000 Leagues titled “On the ocean floor” depicts a kelp forest with large corals, crustaceans, and a flotilla of giant jellyfish whose bodies and tentacles radiate light (figure 9.6). Cameron’s vision of bioluminescent organisms flour­ishing on a nearby exomoon is similarly prescient. Figure 9.6. An original illustration from Jules Verne’s 20,000 Leagues Under the Sea depicting bioluminescence. A more modern media representation is in James Cameron’s 2009 motion picture Avatar, where bioluminescent creatures inhabit the exomoon Pandora, where the action takes place. On Earth, thousands of species of sea creatures of all sizes employ bioluminescence (Jules Verne’s 20,000 Leagues Under the Sea). Explorer (WISE), which was launched in 2009, has finished a scan of the entire sky at infrared wavelengths. In 2011, astronomers reported six of the coolest stars ever found, one of which has a sur­face at no more than room temperature.61 The WISE data have the potential to reveal brown dwarfs closer than Proxima Centauri, the nearest star to our Sun. Another promising mission in the search for dwarf stars and transiting exoplanets is headed by Harvard astronomer David Charbonneau and was designed largely by Philip Nutzman, an as­tronomer at the University of California, Santa Cruz. The MEarth Project is focusing eight small robotic telescopes on 2,000 M dwarf stars.62 The project targets particularly M dwarfs as they are smaller than the Sun and transiting planets would block out a greater portion of the star’s light, making them easier to detect. Studying nearby transiting exoplanets could afford astronomers a better sense of whether Earth-like planets are common and ad­ditionally allow astronomers to discriminate the chemistry of their atmospheres. Within six months of launching their project, the team detected their first transiting planet, a super-Earth named GJ 1214b in orbit around a star 13 parsecs from Earth.63 In 2010, the journal Nature reported that the atmosphere of GJ 1214b was found to be comprised either of water vapor, or of thick clouds or haze as on Saturn’s moon Titan.64 Infrared investigations are planned to determine which of these options exist on the planet. With resources like Zooniverse. org, in the coming decade the pub­lic will likely contribute to the search for biomarkers such as ozone or water vapor in the atmospheres of these other worlds. Awash as it is in newborn stars and exoplanets, the universe may be teaming with life. Perhaps in some far future humans will have physical, robotic, or other means of virtual presence on a nearby exoplanet or one of its moons that, similar to Cameron’s Pandora, teems with bioluminescent life. Astronomer Carole Haswell cau­tions, “If any of this is to happen, however, we need to use our collective ingenuity to understand and repair the effects that our industrial activity and our burgeoning population are having on our own planet.”65 What we learn from exoplanets, Haswell sug­gests, might be invaluable in understanding Earth’s climate evolu­tion and in ensuring our own survival and that of our companion species. In the meantime, NASA and the astronomical community welcome the public’s contribution to one of humankind’s greatest adventures—locating possible habitable planets and, in time, the signatures of life in some dark and overlooked corner of the vast and silent wastes of interstellar space. Balbi points out that galaxies are clustered throughout space and they have a very slight preference for spacings that can be thought of as corresponding to sound waves. These galaxy sepa­rations designate grooves or “acoustic peaks,” as in a wave, and represent gravity and temperature variations on the cosmic micro­wave background, which evolved into a subtle imprint on the dis­tribution of galaxies. One wave that’s clearly detected in the galaxy distribution has a scale of 300 million light-years.50 Astrophysicist Jean-Pierre Luminet likewise claims that the early universe “‘rang’ like a musical instrument.” He explains that the variations or peaks and troughs we see in the cosmic microwave background reveal details of the universe’s mass and density in much the same way acoustic waves reverberating through a drum reveal its struc­tural properties. “If you sprinkle sand on the surface of a drum,” writes Luminet, “and then gently vibrate the drum skin, the grains of sand will assemble into characteristic patterns” that reveal data regarding “the size and shape of the drum” or “the physical nature of the drum skin.”51 Similarly, in analyzing the variation in clusters and superclusters of galaxies, we are gathering details about the matter density of the primeval universe. University of Virginia astronomer Mark Whittle likewise char­acterizes the variations in the microwave background as similar to the crest and trough of sound waves: “The waves are actually very long; they’re many thousands of light years, and so they cor­respond to frequencies, pitch which is very, very low by human standards, roughly 50 octaves below human ears.”52 Whittle has produced a sound file simulating what the big bang would sound like if modulated for the human ear. Describing his recreation of the acoustic peaks in the cosmic microwave background as a “sort of a raw, deep roaring sound,” Whittle is quick to note that there’s “actually musicality present.”53 He describes WMAP’s image of the microwave background as “a microscope. . . a telescope. . . a time machine, all rolled into one, and stored in it is enough infor­mation to kind of diagnose what the character of the universe is today, what its future will be and what its birth was.” Of this “ex­traordinary document,” Whittle reminds us that embedded in the image is the primeval narrative of the universe “written by nature in nature’s own language.”54 COBE and WMAP (and now Planck) have given nature a voice. Amedeo Balbi observes in The Music of the Big Bang, “Ripples in the matter density of the early Universe had to leave a perma­nent imprint in the ancient cosmic light—as a seal impressed into wax.”55 Cosmologists theorize that etched into the primordial plasma at the beginning of time were density and heat variations that became the galaxy clusters we observe today. Balbi’s meta­phor of matter density fluctuations imprinted on the cosmic mi­crowave background as indentations in wax brings to mind an early method of creating phonograph records by etching grooves in wax. Early sound recordings involved “engraving” data into a wax overlay of a zinc record. Music or voice data were recorded by tracing with a sharp stylus a spiral onto beeswax coating the zinc record. The disc was then treated with chemicals that pre­served the grooves where the stylus had removed the wax, after which the phonograph record could be played. As early as 1931, Georges Lemaitre apparently wondered whether information about the universe had been recorded in the primordial quantum, even as information is preserved in the grooves of a phonograph record. 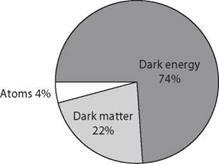 Lemaitre observed that “the whole story of the [universe] need not have been written down in the first quantum like the song on the disc of a phonograph.”56 However, the WMAP results suggest that, in fact, it was. From Lemaitre to Balbi, the technology of the grooved record and the shape of an acoustic wave served as apt metaphors for peaks in the cosmic microwave background.57 Had we some other technology for recording sound in the time of Lemaitre, perhaps astronomers would have characterized these acoustic peaks in other terms. On the other hand, scientists find that acoustic and electromagnetic waves are means by which the universe, the stars, and planets tell their story. Astronomers and cosmologists, since Pythagoras, have never given up on finding music in the cosmos. And now they have. Above all scientific projects, the Hubble Space Telescope encapsulates and recapitulates the human yearning to explore distant worlds, and understand our origins and place in the universe. Its light grasp is 10 billion times better than Galileo’s best spyglass, and many innovations were needed for it to be realized: complex yet reliable instruments, the ability for astronauts to service the tele­scope,1 and the infrastructure to support the projects of thousands of scientists from around the world. The facility and its supporters experienced failure and heartache as well as eventual success and vindication. is liberation from the blurring and obscuring effects of the Earth’s atmosphere. 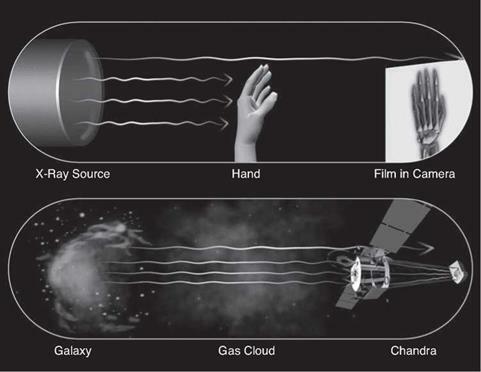 Ground-based telescopes typically make images far larger than their optics would allow because turbulent motion in the upper atmosphere jumbles the light and smears out the im­ages. Hubble gains in the sharpness of its vision by a factor of ten relative to a similar-sized telescope on the ground. Earth orbit also provides a much darker sky, which affects the contrast and depth of an image. The difference you might see in going from a city cen­ter to a rural or mountain setting is only part of the story; natural airglow and light pollution affect even the darkest terrestrial skies. A vacuum can’t obfuscate. The last feature of a telescope in Earth orbit is its ability to gather wavelengths of radiation that would be partially absorbed or even quenched by the Earth’s atmosphere. Hubble has taken advantage of this by working at infrared and ultraviolet wavelengths. The Hubble Space Telescope (HST) is well into its third decade of operations, and it’s easy to take for granted the beautiful images that are released almost weekly. But it was not an effortless jour­ney for NASA’s flagship mission.